My father is keen on walking, and when I was a child in the UK we did it a lot. Mostly up mountains, with essential elements being gorse, bogs, driving rain and periods of being lost. In Dad's eyes you hadn't had a successful day out unless you returned cold, wet, scratched and two hours later than anticipated. If I remember, we wore wellies (gumboots) in winter and plimsolls in summer, although Dad had a pair of leather walking boots that may or may not have been comfortable. The joy of walking has stayed with me, although I've noticed in the almost 50 years since I went up my first hill that "walking" has become something you do to the shop at the top of the road. These days enthusiasts "tramp" (in New Zealand), "hike" (North America), "bushwalk" (Australia). Some people even "ramble" in a twee fashion (England). Scenery during our Hsipaw trek. The village is where we spent the night, the area is a big tea growing area. In Southeast Asia you "trek" like a Sherpa, so that's what we did in Myanmar. Twice. And those two (albeit guided) walks were among the best experiences of the trip. The countryside was spectacular, the villages interesting, and the people we met friendly. The food was good, the company enthusiastic, the guides knowledgeable. In a country where many of the more remote rural areas are still closed to foreigners, trekking was a great way to see life outside the cities. These lovely woven panels are typical of houses in this area. The photogenic kid is extra. Below, a small boy eating breakfast in a similar woven house. And below that, the same house again, actually a small shop - zoomed out. I just think they are so pretty. Our first trek was from Hsipaw, a small hill town northeast of Mandalay towards the Chinese border. Geoff and I abandoned Sam and joined four other travellers (English, Swiss, and American) and a guide for walk through Shan and Palaung villages and even some Shan rebel checkpoints. (One Shan soldier we passed was on duty holding his young baby, so I suspect no one was expecting much military action.) We covered 20-odd kilometres each day, with the first day involving marching up to he top of the hill (Dad would have been pleased) and the second day marching down again. Our morning tea stop on day 1. The villages all have these small shrines at the entrance - to the Nats, or spirit Gods. A bad Nat can bring horrible luck - NEVER pee under a tree, for example, or the Nat of that tree will get you for sure. But good Nats can protect you and your family. The little shrines contain food, beds, even a mosquito net for the Nats. Washing facilities at one house we passed. Pretty typical. 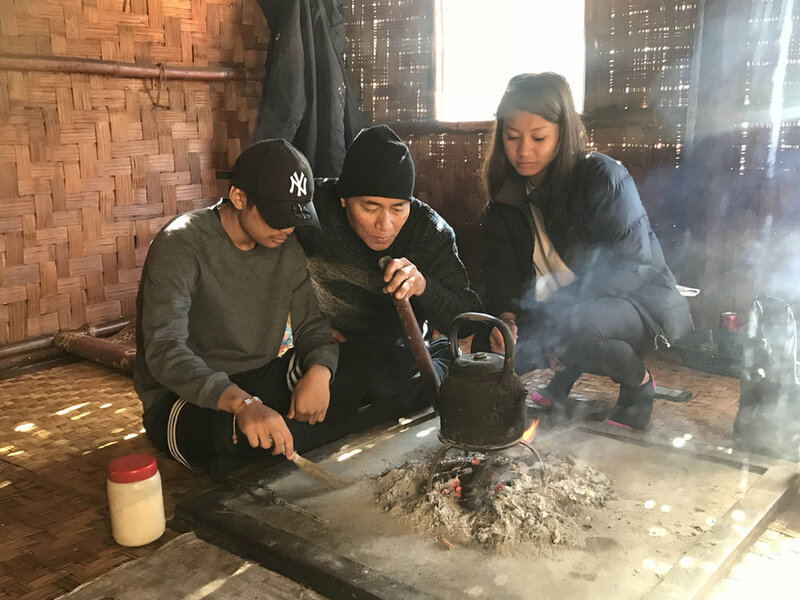 We spent the night in the Palaung village of Pankam, sleeping on mattresses on the floor, with buffalo underneath and a long drop toilet in the garden. It was wonderful. Even the long drop. Early morning in Pankam village. Not bad, huh? Our second trip was from Nyaungshwe, near Inle lake. With 13 people, including reluctant teenage walkers, the pace was considerably slower, but the experience no less fabulous. And I have to say everyone was hugely stoical. I put lots of photos of this trek in my Christmas Day blog, but here are a couple more, just for the lols. Our lunch spot on the Inle Lake trek. The food was fabulous! Arriving in Koung Soung - the end of a long day, mostly uphill! Postscript: In memory of my childhood, I wore my 15 euro Greek trainers for our treks. They were pretty comfortable, and conveniently fell apart on the last day of the final trek. I threw them away and bought some faux Myanmar Adidas - sorry Oxdans - instead.